Yorkshire's premier Shepherd's Hut company, handcrafted since 2005. Welcome to our The Yorkshire Hut Company and thank you for visiting our site. We are a York based family run business specialising in making hand crafted stunning shepherd's huts and delivering them to delighted customers nationally and internationally. Wonderfully romantic, our garden structures make perfect garden offices, studios, hideaways, extra living spaces, rental properties, or whatever other need or desire you have for your structure. They are habitable all year round, and created just for you, for your lifestyle. In fact we have not made one shepherd's hut the same as another as our huts, like our clients are all individual. 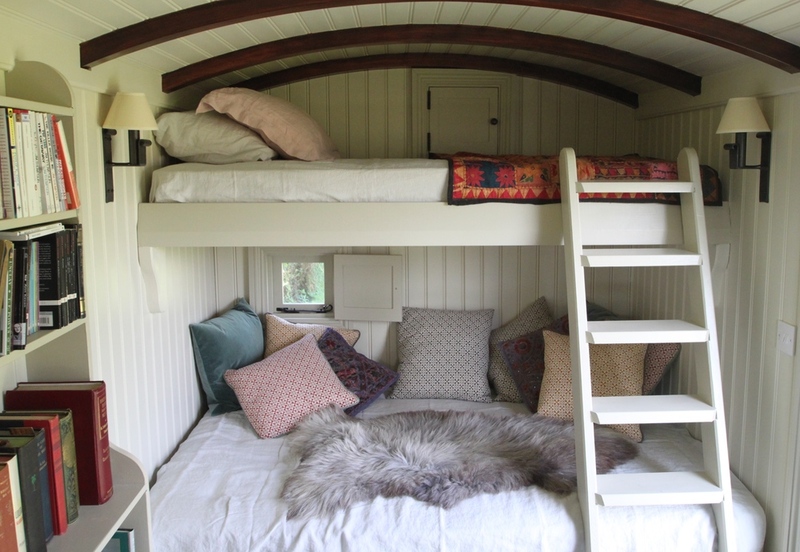 It has been our dream to own a Shepherds Hut for quite some time. So what a pleasure it has been to meet Kevin, Pennie and Rory and for them to fully realise our Hut and to make something so bespoke to our requirements.Our shepherd’s hut is a very special place for us to enjoy as a family. - Ben & Anna, Yorkshire. Handcrafted throughout, a home from home. Despite their obvious charm and bygone looks, The Yorkshire Hut Company's Shepherd's huts are a truly modern option and as each one is individually designed and hand crafted they can be created to suit whatever your requirements, whether it needs to be an home office, a studio, an extra bedroom, a bed and breakfast or something completely different. We have made many shepherd's huts to date and yet not one exactly the same as another as we believe in providing an individual service creating the shepherd's hut of your dreams. working here, away from the pressures of housework, and this week has been really productive. We believe in true craftsmanship and design and make every aspect of our shepherd's huts ourselves, from the pattern of the wheels through to the hand crafted windows and doors and roof spars. We continue to make shepherd's huts in a traditional way whist combining modern technologies and specification to create shepherd's huts to withstand the test of time. Their thermal qualities are fantastic and their high quality craftsmanship defy planned obsolescence. Versatile living and sleeping handcrafted for your requirements. Our clients are important to us therefore it is important that we create beautiful places in our shepherd's huts, that you wish for, from conception through to completion. Whether you would like a shepherd's hut in it's most basic finished form or fully furnished with Golden Ratio designed furniture and storage, our mission is to make you the shepherd's hut of your dreams and one which fulfils it's purpose. Pennie's background is in art, design and education. Pennie and Kevin have built The Yorkshire Hut Company upon a sense of responsibility to design and to make shepherd's huts that are not only aesthetically pleasing, functional and fit for purpose but have a responsibility towards the environment and providing clients with an exceptional product and service. Isaac, our in house bright spark welder-fabricator, qualified and experienced, has worked as part of the team at The Yorkshire Hut Company since 2015. Kevin is a fully qualified and experienced craftsman and teacher at The Yorkshire Hut Company with a BA Hons in Design and 29 years experience of hand crafting unique products. He has been passionate about creating products and working with timber from a young age and has a wide variety of skills knowledge and experience from construction through to fine furniture making. At The Yorkshire Hut Company we believe in passing skills forward, always having a keen apprentice in training. Theo joined last year after being at Leeds Art University and is already proving to be a valuable asset to the team. We also believe in diversity in the workplace and Tim has been an great addition to the team, having worked in furniture construction in Australia and with a background in a variety of trades. Tim has worked with us since earlier last year and we are now supporting Tim to complete an architectural joinery apprenticeship as a mature student with us at the Yorkshire Hut Company.